Very easy. Pollinated by hummingbirds. Not always long lived but will self sow. Do not over fertilize. Columbines are long-time favorites in the perennial garden. They have a beautiful, unique flower shape that I am never quite able to explain. They flower late spring to early summer - and longer during cool, wet summers. The plants prefer a moisture retentive soil rich in organic matter and light shade or dappled sun. 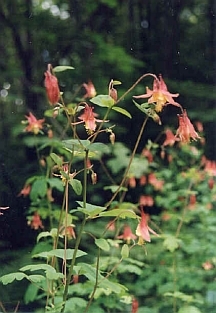 Columbines will tolerate drier soil and fuller sun but blooms will not last as long. Likewise, they can take heavier shade but flowering will be less profuse. Division is not needed or recommended.